Repro, .303" P'14 Volley Sight Pointer Set. 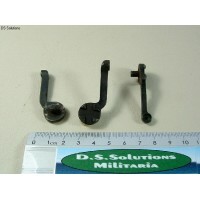 These are reproduction, front volley sight pointer sets for .303" P'14 Rifles. These sets are made for us. 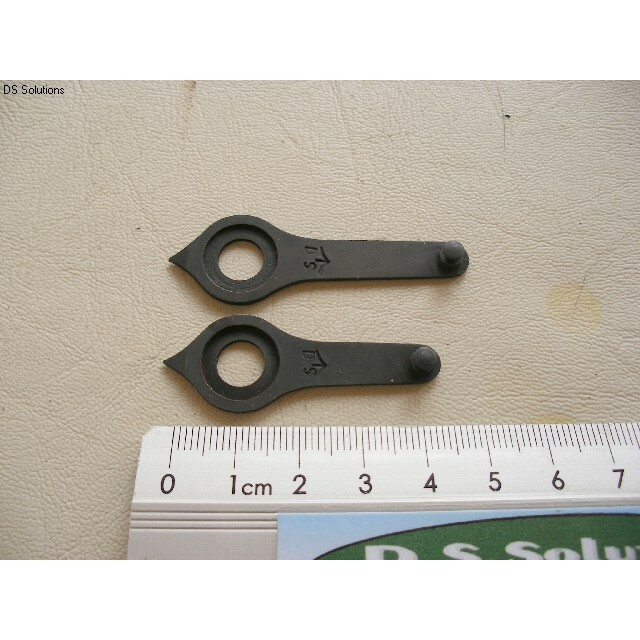 The pointers come complete with the tensioning spring and the screw to secure them to the range scale plate. The long range volley sights were original equipment on all Lee Enfield Rifles up to the SMLE MkIII and including the American built Pattern 1914 Rifles. 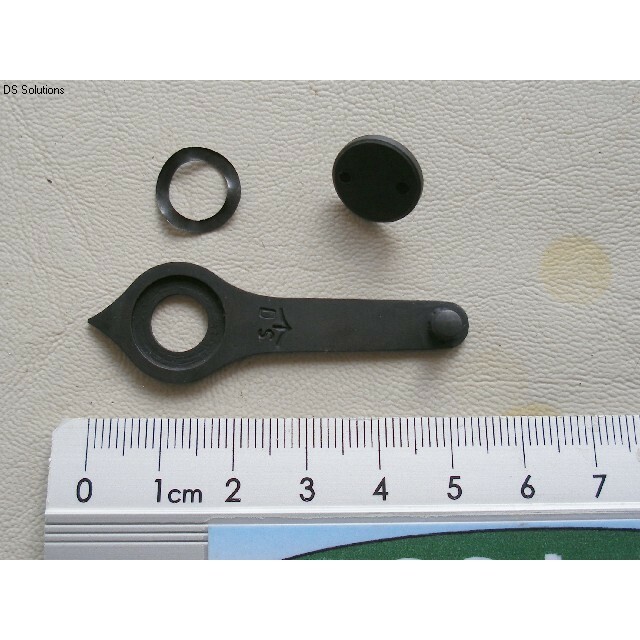 Due to the differing sight radius of the volley sights on the P'14 Rifle, the front sight arm (pointer) was appreciably longer than that fitted to Lee Enfield series rifles (see picture 4). They were designed so that a squad, section or Platoon of men could put down a volley of aimed shots at extreme ranges - up to 2,600 yards, on targets such as a cross roads, a body of marching troop or a squadron of cavalry. With the advent of trench warfare on the Western Front during WW1, when average combat ranges were 100 to 200 yards, and no-one in their right mind would form up in the open to fire carefully aimed volley's, the sights soon became obsolete. Hardly any P'14 Rifles were used by front line troops during the First World War, save a few issued as sniper rifles. The majority of them were put into store, remaining there until WW2 when they were removed from store, overhauled and issued to second line units and Home Guard, or converted to sniper rifles. The overhaul of the rifles to 'Weedon Standard' included removal of the now obsolete volley sights, although - as with the SMLE's put through overhaul - usually the range scale plate was left in the stocks as a filler. Many P'14 Rifles which were sold off in the inter-war years and which retained the volley sights, and some which made it through the overhaul program with the sights untouched, can still be found but without the front pointer, tensioning spring and screw. This kit will fit directly on to these rifles. 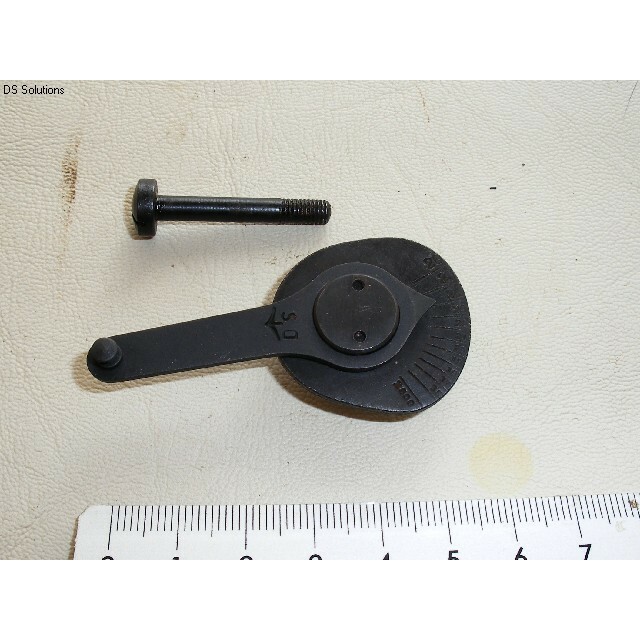 Unit of Sale; 1 Set consisting of 1 pointer arm, 1 spring tensioning washer and 1 securing screw. 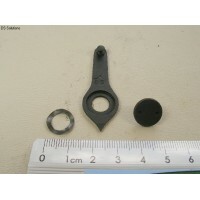 Please note that picture 3 shows the pointer set assembled to the range plate. This is for illustrative purposes only and is NOT included with the pointer set. 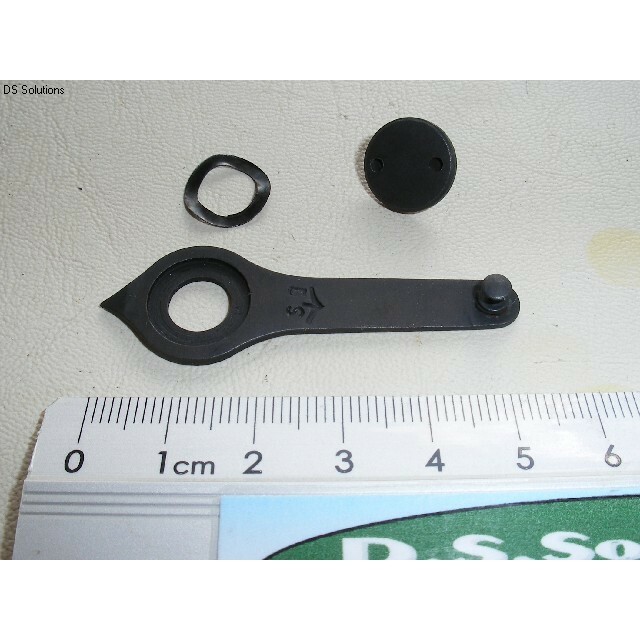 See elsewhere in this section for the complete front volley sight complete with range plate and fixing screw.